I met Bill Johnson, founder of Brilliant Harvest, at the EcoFriendlyFloridaFest and then spoke with him again at National Drive Electric Day a few weeks ago. He is knowledgeable, easygoing, and up to date on all things solar. He offers pleasant passion for renewable energy as a provider who knows his work both technically and creatively. As the CEO of Brilliant Harvest and as an EV enthusiast, Bill was keen to become a Tesla contractor. “Getting certified as a Tesla installer is a testament to the quality of our work,” Bill told me. The hanging panels are partially see-through. The light is transmitted through the panel. Imagine what filtered sunlight creates — a wonderful pattern of sun and shade. Brilliant Harvest in not a cookie-cutter solar company. Bill and his team work with clients to deliver solutions that fit the needs of each individual’s solar designs. A lovely array of solar accomplishments mounted on the wall of the Brilliant Harvest office feature dynamic photographs. Bill pointed out a project with the solar panels integrated into the structure, thus providing shade as well as generating electricity. 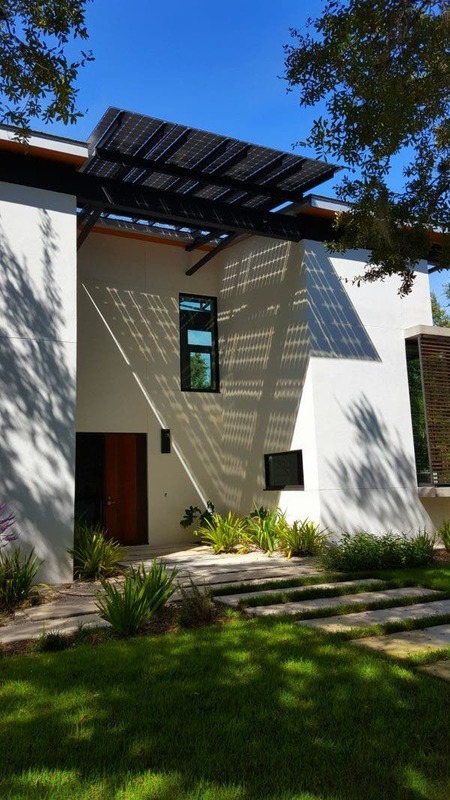 The solar panels create walkways among sunspots mixed with shade. The thoughtful aesthetics combine the best of nature, art, and technology. 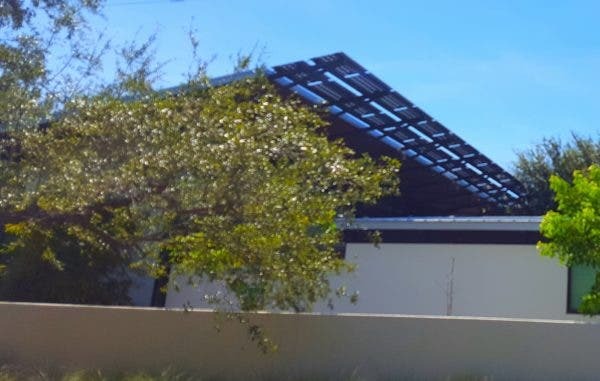 Honor Award for Sustainable Design from the American Institute of Architects/Florida-Caribbean, with an artistic solar panel installation by Brilliant Harvest. I drove by to experience the passerby’s view of the house. The old McClellan Park neighborhood is picturesque on its own. 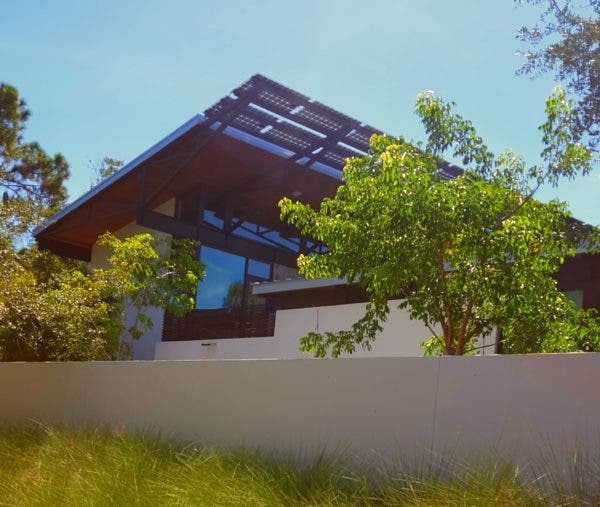 The house swept up the AIA award for a variety of reasons, rising above others for technological and artistic reasons among the entire Florida–Caribbean region. I delighted in the patterns of sun and shade due to the solar panels blending with the leaves and branches of the trees. The panels transmit a filtered sunlight down through the panel. Another photograph in the office is a display from South St. Petersburg over a large air-conditioned structure. It is a >100,000-watt system, with the panels on the wing of a self-storage facility producing more energy than it consumes. Sending energy back to the main building offsets energy consumption of the main building and cuts energy bills drastically. As noted in the title, Brilliant Harvest recently landed a deal with Tesla to become one of its certified residential and commercial Powerwall installers. “The Powerwall is a Tesla home battery system that turns your home’s solar panels into an all day resource — increasing self consumption of solar — while offering back-up in the event of outage.” Typically, if solar panels produce more power than a home needs, the excess goes back to the grid. The Powerwall instead enables a homeowner to capture and store excess solar power produced during the day for use at night. Bill notes that problems with solar policies (in Florida) are improving, but are far from over. As I recently wrote, 73% of Florida voters voted “Yes” in August for pro-solar legislation. However, Amendment 1 needs a “No” vote in November.